This lot have caught our ear very early on. A five-piece, in their 20s, with just one EP under their belt, unsigned and from Australia. So what’s their name? Murmurmur? Eh? Say that again? “It’s a play on the word ‘murmur’,” says frontman, guitarist and songwriter Will Fletcher on a very early morning call from his home in Melbourne. “I’d been doodling and had the word ‘murmur’ over and over on the top of a page so I took a section from that. Words mean a lot to the 27-year-old. As chief songwriter for the one-year-old band, he’s already putting personal experience into the four songs that feature on their new, self-titled EP. The sound you hear is colourful, complex psychedelia that veers from shoegazey haze (Little Boy) to bright, Beatlesy love songs, drenched in electronica (Marmalade). “[Lead track] Cable Car is about the music business,” he explains. “It’s about depression and struggle as a musician… yeah, I’ve been there. With only five gigs to their name and while they find their feet, Fletcher has a day job (“in a really awful gourmet fancy supermarket for rich people”), also playing with local alt-pop trio City Calm Down when they tour. The band have a penchant for vintage analogue equipment – “high end amplification and guitars!” – so it’s fortunate their rehearsal space costs absolutely zip, rehearsing in a bungalow in Fletcher’s back garden. And the band’s current influences? “I’ve been into prog for a while,” Fletcher says. “The musicianship is unbelievable. I’m a huge Radiohead fan and I love King Crimson. At the moment I’m listening to lots of Camel and Yes. 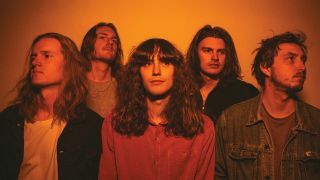 With other Aussie bands such as Tame Impala opening doors for the continent’s superb brand of sun-scorched psych, why does psychedelia still appeal? By the time this reaches the newsstands, mumurmur will recorded another four songs and be looking to get playing beyond Oz. “We want nothing more than to tour, and get out of Australia.